This Press, with 6" dia. cylinders by 8" wide will print as a flexo or as a gravure, or both, at one time on the same side of the stock. 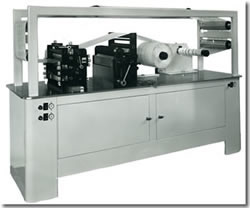 This dual function will permit a gravured label to have a flexo insert on one pass. The Press, with unwind and power rewind, is mounted on a 10 ft. base, as shown. Drive motor is DC variable speed.